When was the state flag of Georgia adopted? 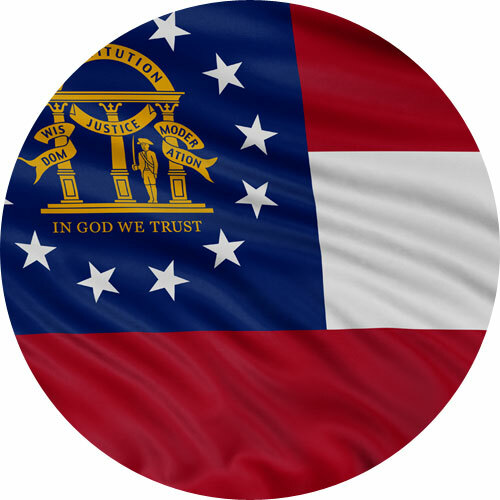 What is the design on Georgia’s state flag and what does it represent? What is the pledge to the state flag of Georgia? How are you supposed to fly the Georgia flag with your American flag? Where can you buy a Georgia flag? The current state flag of Georgia was adopted in 2003. However, since 1879 Georgia has had several different flag designs before our current state flag. Georgia also leads the nation in the number and variety of different state flags. The state flag of Georgia contains three stripes which are red, white, and red. In the canton (upper left corner) of the flag, lies the Georgia Coat of Arms in gold surrounded by thirteen white stars. The Coat of Arms contains an arch, held up by three pillars. A male figure dressed in colonial attire dating back to the American Revolutionary War, with a sword drawn in his right hand, is standing guard between two of the pillars. There is a banner wrapped around the pillars and hanging from the arch with the state motto: “WISDOM, JUSTICE, MODERATION”. Positioned below all of these elements is an additional motto: “IN GOD WE TRUST”, which is placed there to announce the state’s “foundation”. The ring of thirteen stars around the coat of arms, symbolizes Georgia’s status as one of the original thirteen colonies. The arch symbolizes the state’s constitution and the pillars represent the three branches of government: legislative, executive, and judicial. 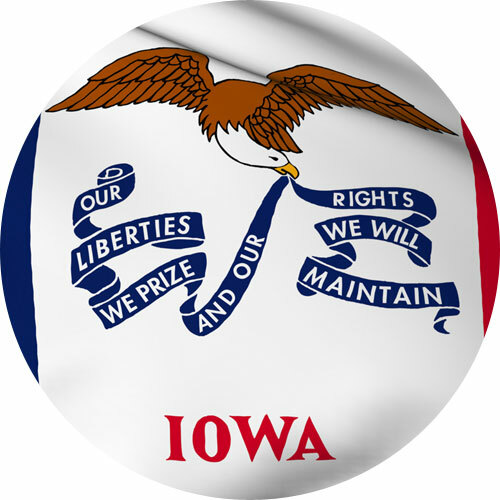 The drawn sword represents the defense of the state’s constitution. This latest design is based on the first national flag of the confederacy, which was nicknamed the “Stars and Bars”. The pledge to the state flag of Georgia is: “I pledge allegiance to the Georgia flag and to the principles for which it stands; Wisdom, Justice, and Moderation.” The pledge of allegiance to Georgia’s state flag was originally passed by the state legislature in 1935. 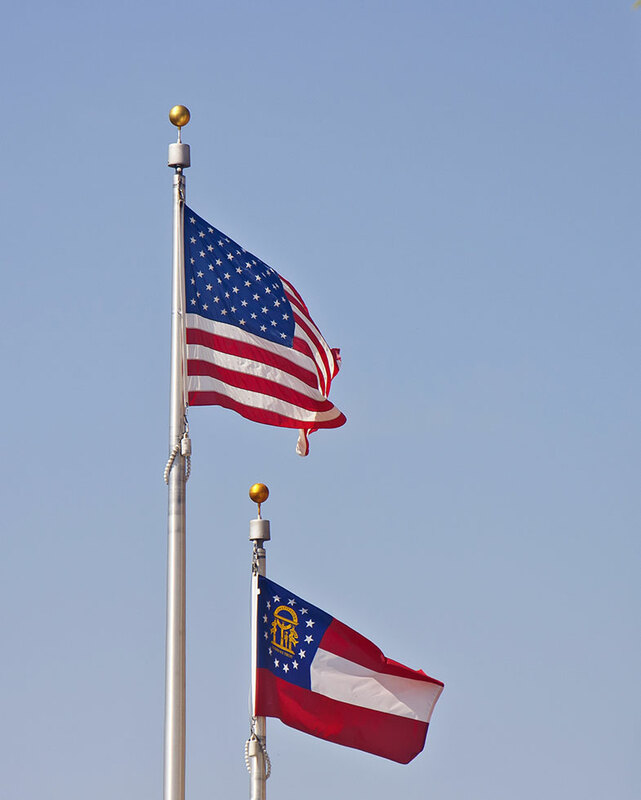 When flying the Georgia and American flag on the same pole, the flag of the United States must always be at the top and the Georgia flag should be the same size or smaller. When It is flown on separate poles, the Georgia flag will be to the right of the flag of the United States situating the U.S. flag in the position of honor, which is to the observer’s left of the other flags. Star Spangled Flag sells a beautiful Georgia flag that is 100% made by materials made in the USA! They use a tough material and add UV protection which adds to the longevity of the flag. They also use superior stitching that helps to prevent fraying and unraveling. A big plus is that they provide free shipping! Georgia is located in the southeastern part of the country. The name of the state was taken after King George the Second of Great Britain. It is bordered by North Carolina and Tennessee on its north, Alabama on its west, South Carolina and the Atlantic Ocean on its east, and Florida on its west. Georgia is popular for its high quality of peaches that’s why it’s known as The Peach State. But Georgia has not put this into the legislature. So the nickname “The Peach State” is still unofficial. But there are more things going on in Georgia than just its peaches. Oktoberfest – Just like in any parts of the country, Oktoberfest is a big thing in Georgia for beer-enthusiasts. Tourists would have a blast if they visit the town of Helen during Oktoberfest because storefronts were remodelled in the 1970s and made to look like a town from the Bavarian Alps. Renaissance Festival – This festival runs from April up to June and is a festival for the whole family with plenty of events and activities for both adults and kids. Reenactment of the Civil War – A free event for the public to see, this event is a big crowd drawer. Tourists come in to see the re-enactment by the Atlanta Campaign Inc.
Cherry Blossom Festival – Takes place at the end of March and has been going on for more than 20 years. The event highlights the attractive cherry blossoms around the state. The event features food, crafts, games, dances, and music. St. Patrick’s Day Parade – Happens in March with many colorful, high school bands, community performers, and vendors in the streets. It’s one of the biggest and most popular event in Georgia. And if you are wondering if there are crazy laws existing in Georgia, the answer is a big YES! It is illegal in Georgia to force pets to take drugs. It is prohibited to picnic in graveyards. Signs should only be written in English. It is illegal to carry an ice cream cone in their back pockets. No donkeys may be kept in bathtubs. If you want to really get into the spirit of Georgia’s festivities, fly a flag in your home. 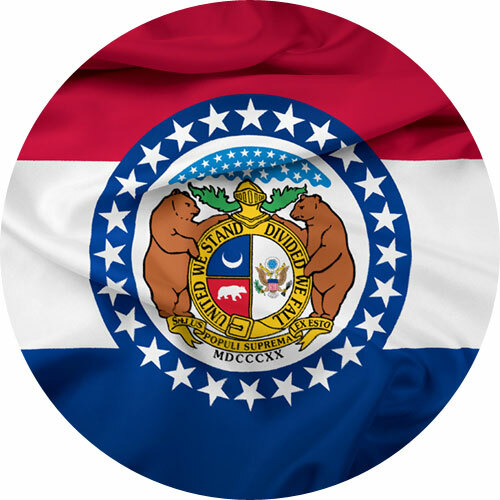 Displaying a flag during national holidays and other state festivals can set the right mood for you in your home and community. Start this as a tradition. Flying a flag and showing love and respect for your country is one display that will never go out of style. Looking for the best flag to fly on national holidays and other state festivities? Want a long lasting flag with robust colors and high-fly ability? Reach out to us! Our flags won’t let you down. They are made from heavyweight 200 denier nylon and treated to withstand weather for outside use. Contact us today!